One of the leading forces in the Russian Revolution, Leon Trotsky was born as Lev Davidovich Bronstein on 26 October 1879 at Yanovka, Kherson Province, Russia. After the 7 November 1918 revolution, Trotsky was second only to Lenin in the Bolshevik hierarchy. On 13 March 1918 he became commissar of war and head of the Red Army. In 1920-1921, Lenin and Trotsky’s political and personal differences again came to the surface. Both were worried by the rise of bureaucracy and railed against it but one man, Joseph Stalin, the General Secretary of the Central Committee, encouraged its rise. Trotsky was on holiday in the Caucasus when he learned of Lenin’s death on 21 January 1924. Stalin stage-managed Lenin’s funeral and positioned himself as the true heir. On 31 January 1928, Trotsky was exiled to Alma Ata in Kazakhstan and in February 1929 was expelled from the Soviet Union. After travelling around Europe, he landed in Mexico at the invitation of the painter Diego Rivera, where he remained for the rest of his life. In 1939 Trotsky moved into Coyoacan, a suburb of Mexico City. Stalin announced that Trotsky had plotted to have him killed and ordered Trotsky’s assassination. At 4am on 24 May 1940, Stalinist agent Iosif Romualdovich Grigulevich, aided by 19 other men, attacked Trotsky’s house riddling the building with hundreds of bullets. Although Trotsky survived, a bodyguard and an American visitor were killed. In the summer of that year Trotsky met a man calling himself Jacques Mornard, who was the lover of Sylvia Ageloff, one of Trotsky’s followers. Mornard, whose real name was Ramon Mercader, claimed to be interested in Trotsky’s political ideas and the two men had many long conversations. On 20 August 1940 Trotsky invited Mornard for tea and, because he was a guest, Trotsky’s bodyguards did not search him nor did they think it odd that he was wearing a raincoat in the heat of summer. These were to be fatal mistakes. Without warning, Mornard pulled out an ice pick and thrust it into Trotsky’s skull, his right shoulder and right knee. 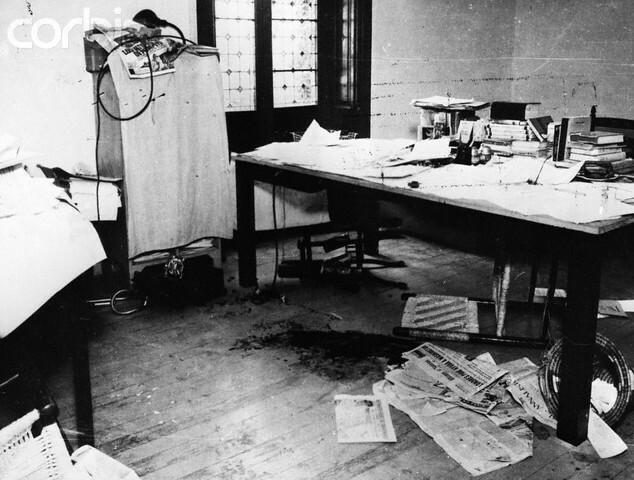 The attack was not immediately fatal and when Trotsky’s bodyguards heard the commotion, they rushed to their boss’s aid. Trotsky, still conscious, called out, “Do not kill him! This man has a story to tell.” The former Soviet official was taken to hospital where he lingered for 26 hours before dying at 7.25pm, aged 61. Mercader’s trial technically began on 22 August 1940, 48 hours after the rrest, in Mexico City. Three judges heard the case and there was no jury. On 16 April 1943 Mercader was convicted of murder and sentencedto 20 years in prison — 19 years and six months for premeditated murder and six months for illegally carrying a weapon. He was released from Mexico City’s Palacio de Lecumberri prison on 6 May 1960 and moved to Havana. In 1961 he relocated to the Soviet Union where he became one of only 21 non-Soviet citizens to receive the Hero of the Soviet Union medal. He died in Havana on 18 October 1978 and is buried (under the name of Ramon Ivanovich Lopez) in Kuntsevo Cemetery, Moscow. Trotsky’s books were banned in the Soviet Union until 1987 and have been published in Russian since 1989.